Known as the City of Monuments for its jaw-dropping skyline of ancient ruins, magnificent towers, and stunning sculptures, Magnimar embodies the spirit of the frontier realm of Varisaia more than any other city. But life in the City of Monuments can be an adventure all it own. With strange monsters lurking amid the city's ancient foundations, bands of thieves battling for control over the city's alleys and the decadent attitudes of its oldest families, Magnimar lies at a crossroads. Will it succeed despite the obstacles thrown in its path, or is the City of Monuments doomed to crumble under the pressure of its own runaway success? An expansive gazetteer of Magnimar's nine districts, from the marble-lined streets of the Alabaster District to the blood-drenched alleys of Underbridge. Notes on the plans and plots of dozens of Magnimar's most famous and infamous movers and shakers, from heads of government to criminal masterminds. Revelations about the city's deadliest mysteries, insights into the cults that plot amid its shadows, reports on the monsters that hunt beneath its streets, and other secrets. Allies and enemies for all sorts of adventures, including healers and hell-raisers suitable for any type of campaign. Stat blocks for a wide variety of Magnimar's denizens, whether they be citizens, angelic guardians, or gigantic monsters that haunt the city's fears and legends. Dozens of connections to adventures set within Varisia, such as the Rise of the Runelords and Shattered Star Adventure Paths. 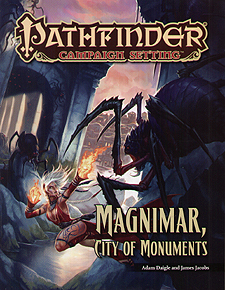 Magnimar, City of Monuments is intended for use with the Pathfinder Roelplaying Game and the Pathfinder campaign setting, but can easily be usedf in any fantasy game.